millennials in growing vegetables, fruits, and herbs at home. doing so in urban environments and they think they do not have the time or space in their home. Below are examples of existing attempts of home gardening in urban environments! IKEA is one of the largest furniture retailers recently focusing is gardening and now selling "growing accessories" but with minimal information for their customers. OBI is German's largest home improvement supply store with a large focus on gardening. They carry more supplies and have more information for their users but both IKEA and OBI are stores users have to go into and sometimes left uninformed. Evrgreen is a well-designed and successful online retail platform for users to buy plants and other household greenery. As this online platform does have good information, it's not as sustainable in the shipping and interactive aspect. Urban Jungle Bloggerss started as a successful blog and now is one of the most popular (coffee table style books) and informative resources for home gardeners. Hobbies include hiking, doing art and anything outside! Andrea wants more information on how to grow and harvest plants at home. Andrea lacks informations information and knowledge on gardening. Additionally, she does not know what resources she will need so she's timid to buy anything when she doesn't know either. During Startup Weekend Berlin (November 2017) Jelena Acker, founder and pictured on the right, and the Greencademy team, went out to Berlin to collect data from interviews. We gained insight from people about their gardening habits, aspirations and daily lifestyles that helped us understand our audience. Below, is our breakdown and analysis of the data we collected from the interviews as well as my explanation to the team of analyzing the organizing that information into user goals and needs. 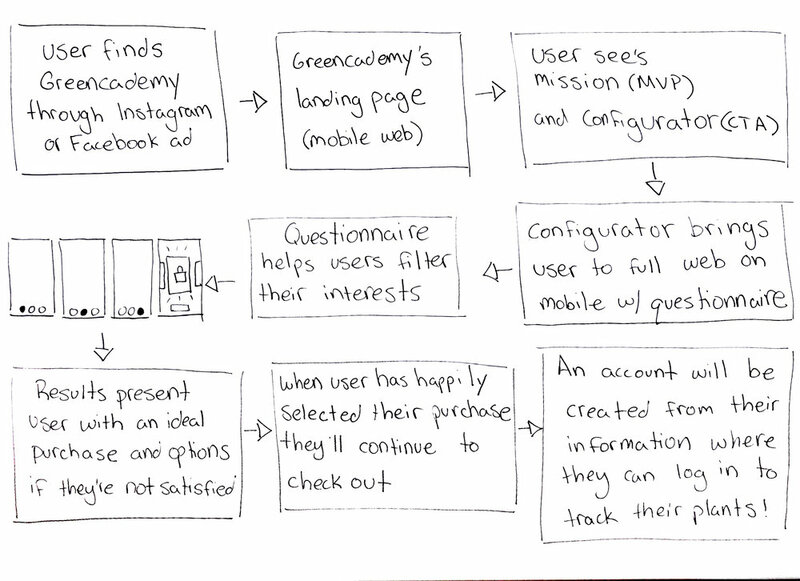 Below is the initial user flow during the on-boarding process. is needed to help users build a personalized gardening experience compared to our competitors! has now changed the MVP focusing on kid’s education in urban farming.